Replacing the taff-rail across the back has always seemed like Mission Impossible. The moulding curves in two directions (both forwards from the middle and downwards at the two sides). 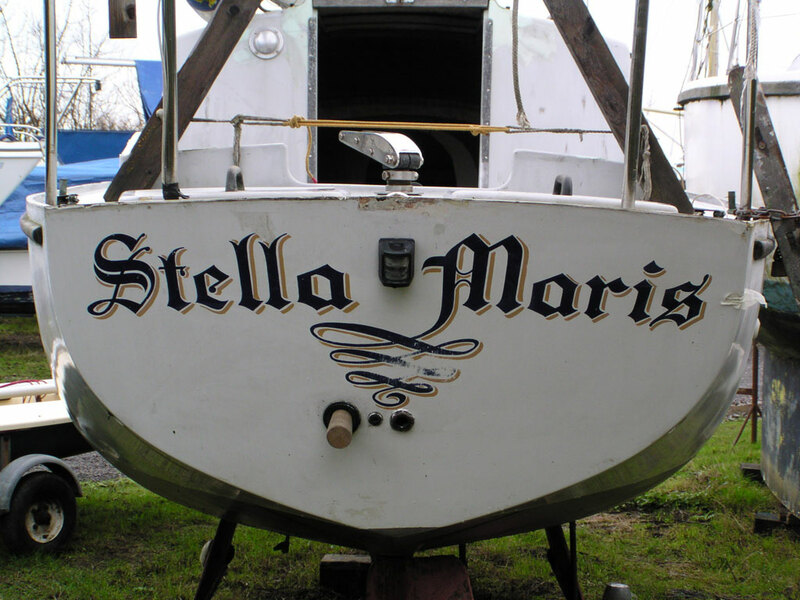 A boatyard had done this for us once on our earlier Trident Eleanor (it was an insurance job) and they had had to do it two or three times because they started with a straight piece of moulding and tried to bend it to the curves. The wood broke easily. 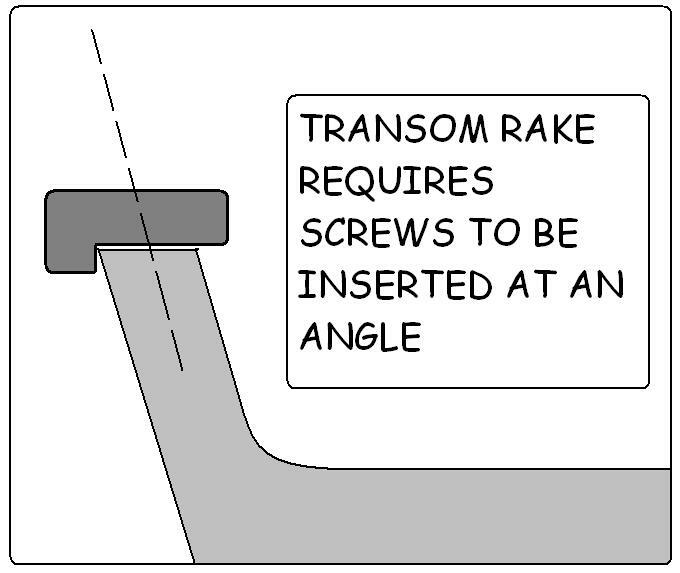 Furthermore, because the transom rakes forwards at quite an angle the fixing screws have to be inserted at a considerable angle or risk them breaking out of the transom (as the yard also found). So ‘professionals’ don’t find this component of the Trident easy either. We decided to fabricate this moulding so we could preform the fore and aft curve. Then it would only need to bend downwards at each end to fit. We bought an offcut of iroko about an inch thick, six inches wide and a bit over 3 feet long – that is about half the length needed. To cut the curved taffrail in one piece would require a much more expensive plank about 6 feet long by 10 inches wide. Doing it in two sections joined in the middle is much cheaper. We traced the forward curve of the aft deck-hull joint at the top of the transom onto a large piece of cardboard and used this template to mark two crescents on the plank (about one inch thick and an inch and a quarter wide) . These two curved pieces were then jigsawed from the plank. When fitted together end to end these two crescents produced the necessary curve and length to fit across the back. These were then scarphed together with epoxy. Unlike the toerail, because this scarph was pre-glued and cured before we attempted to fit it, and cutting the curve meant the wood would not be bent so as to put shearing stresses on the glue joint, this scarph was done horizontally. We used epoxy to stick it after washing the mating surfaces in acetone to reduce the natural wood oil. Once the joint was cured, the necessary L-shape was cut and the corners were rounded off with a router to match the toe rail sections. 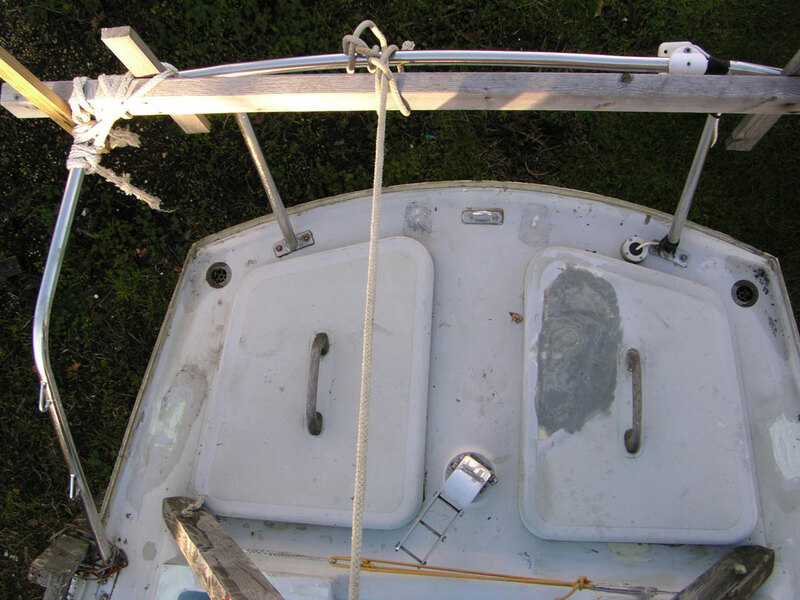 Along with the toerail, the taffrail was fitted after the hull/deck joint had been sealed and the deck resprayed. When it came to fitting, it was easy enough to screw it in the middle and progressively bend down the ends. Screwed and plugged. Note the scarph in the middle. 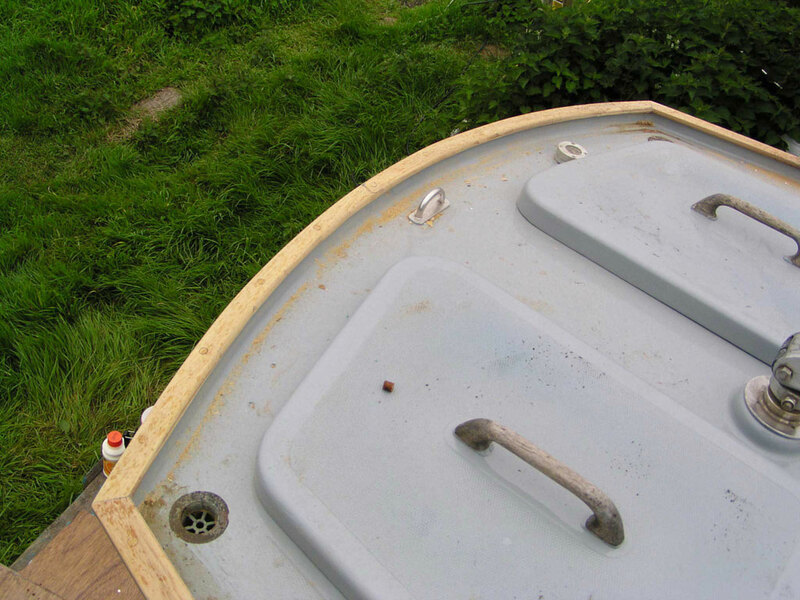 The tricky things with fitting were the steep angle forward which the holes and screws need to take because of the rake of the transom and cutting a decent mitre with the toe rails. 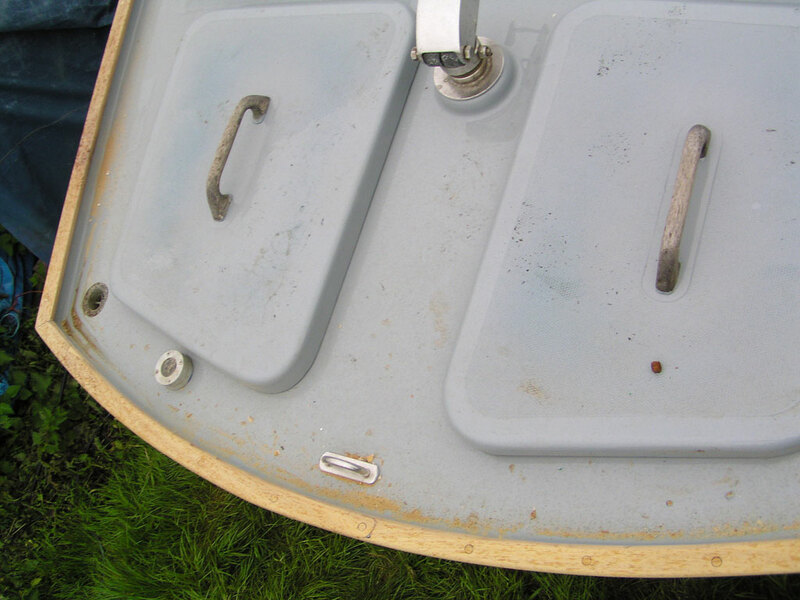 If you drill and screw the taffrail vertically, there is a danger the screws will break out lower down through the transom.